We will forget the little things that are troubling us. We will forget to be angry or frustrated when we get stuck behind that awful driver. 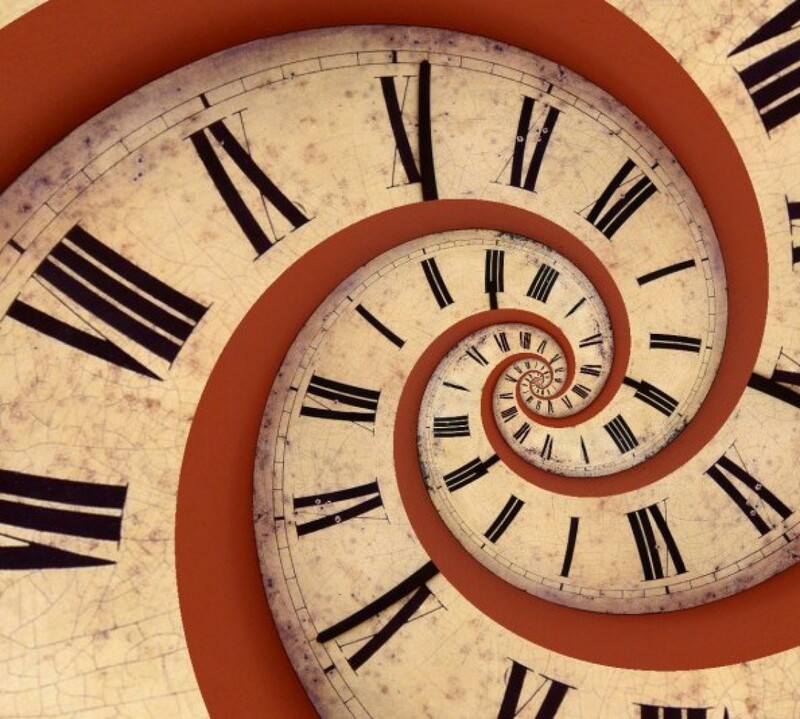 We will chill out when we inevitably choose the slowest line at the checkout counter. We will smile anyway when someone hurts us. We will extend kindness to a stranger who—for all we know—may be in desperate need of some. We will forgive the petty arguments we are in the middle of. We will allow bitterness to loosen its grip on us. We will hold close the ones we love and tell them how much they mean to us. Miraculously, we did that ten years ago this week. We all stopped and for at least ONE day, we remembered the most important things. We remembered that all we really, truly need is right in front of us… be it family, friends or neighbors. We remembered what a gift it was just to be safe and to be alive. We learned that kindness and goodness will always trump jealousy, selfishness and rage. This is how we should live each day, even though we don’t. Believe me… I include myself in that I-don’t-do-it-even-though-I-know-I-should category. I worry, I fret, I pace and I wring my hands while obsessing over what I think I need to accomplish that day, over a lack of money, or a lack of time, or a lack of respect I think I deserve, or an awful thing that someone said or did to me. We will take a breath and remember. And rather than dwell on everything that has gone wrong … we will pause and give thanks for everything that is still right. 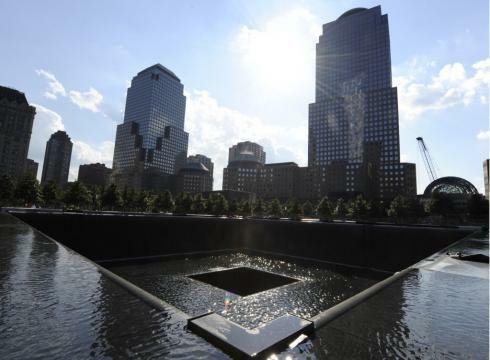 This waterfall at the site of the 9/11 memorial at ground zero now fills the "void" left behind by one of the fallen towers. 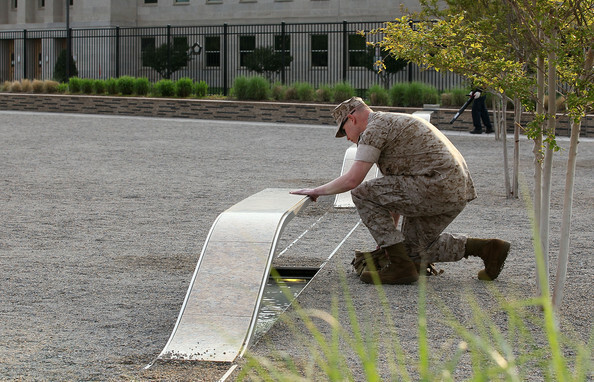 A serviceman kneels at the 9/11 memorial at the Pentagon. 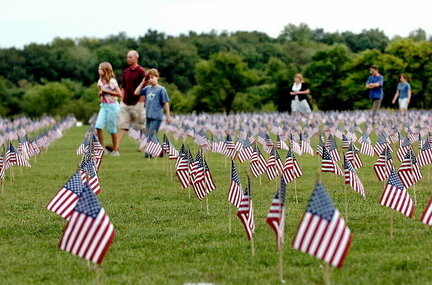 Families walk amidst endless flags in Shanksville, Pennsylvania. Thank you t 🙂 I’m glad you stopped by too! You are so right. Beautiful piece. There is absolutely nothing more to say. You have said it all. Thanks for the much needed reminder. This brings a tear to my eye! Thanks for saying what we all need to hear! Thank you Mom and Jan 🙂 I’m glad you enjoyed it… again. Thanks Renee! I am just now getting back to re-reading and commenting. Thank you for sharing… and I hope you had a great weekend.